A record number of women are running for political office in 2018. KQED's series "The Long Run" focuses on a handful of candidates from California, who are gunning for seats in everything from city council to Congress. We brought together two candidates, Sam Parcher, a 28-year-old high school teacher, and Barbara Leary, a retired 69-year-old nurse practitioner, to talk about their experience on the campaign trail. 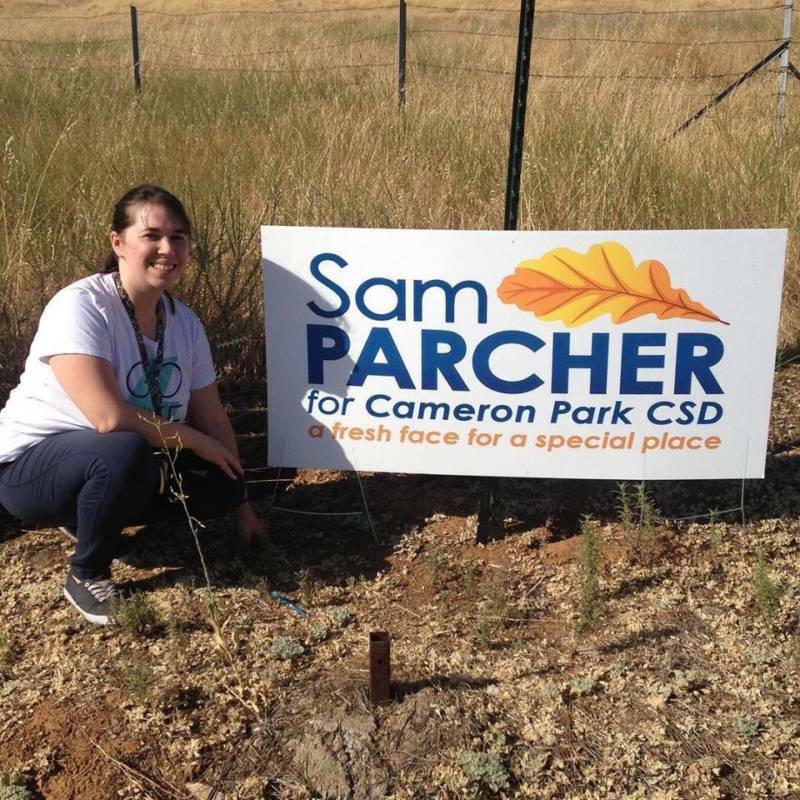 Parcher is running for Cameron Park Community Services District Board of Directors and Leary for Folsom City Council. Leary: I've been involved in politics since I was very young and my mother worked for a candidate that was running for state assembly and then senate in the South Bay. I used to accompany her walking precincts when I was about 10 years old. I've been involved in a lot of campaigns ever since then because that became my passion in addition to my regular job and being a single mom. Parcher: You've been involved in politics for a long time. Is this your first time running for office? Leary: Yeah. I have considered running for office before I worked as a nurse practitioner at the local major trauma center, UC Davis, for 31 years and during that time I was also a single mom. I was very active in my community though because we had a lot of issues surrounding development and I decided to get involved at that level in my town. I also have supported a number of different candidates in our area who I felt had more progressive values than the ones that were currently in office. So my hobby has been, in addition to being a nurse practitioner and a mom, to get involved in local politics. Parcher: I'm kind of finding a lot of pressure being a new mom. My daughter is seven months old now and I’m working full-time finding that balance — that work-life-politics balance. Do you have any tips or how did you get through it? How did you survive? Leary: I survived because I really enjoyed doing the work and trying to make changes in my community. I like talking to people. It actually became my social life. I was coming home from work and my daughter would come with me to a meeting when she was really young. Later, she would be having a ballet class or horseback riding class and I would be, you know, dropping her off there and then going to a meeting and then coming back later and picking her up. "The best part is when you're canvassing, you find someone home, and they want to have a conversation." 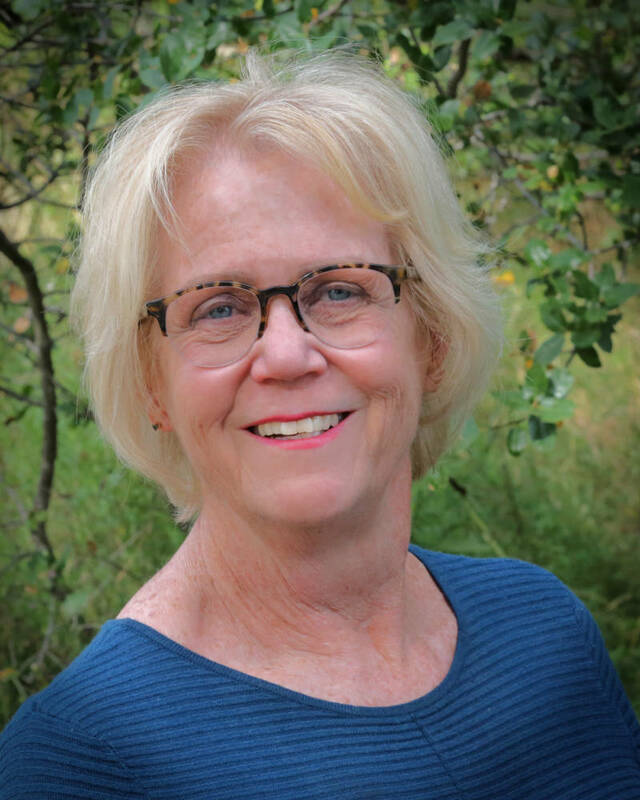 Barbara Leary, candidate for Folsom City Council. She did spend a considerable amount of time in the back of Folsom City Hall doing homework if I didn't have somewhere else for her to be or couldn't find a babysitter. 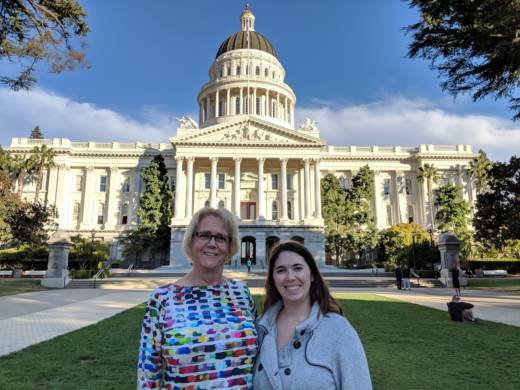 She always said, “I hate all that political mumbo jumbo.” But she's gone on to go to law school and is currently an attorney working for the League of California cities and is very involved in the political mumbo jumbo. Leary: So what made you decide to run for office? Parcher: I would say a few different factors really motivated me. I've always been interested in politics — kind of very similar to you. My family's been politically motivated. My grandma and my mom both campaigned for John F. Kennedy back in the day. It was kind of the same picture that you were painting — my grandmother bringing my mom along to do those types of things. And it's always really fascinated me. I also volunteered for campaigns throughout high school. Recently I have — with how divisive politics have become — really felt like I needed to be more involved. I can't say that things are bad without actually doing everything in my power to change them. And that's something that I tell my students — I'm a high school teacher, an English teacher — all the time. One voice, one person can have a big effect on society. That's what my entire senior English curriculum is about. I felt a little hypocritical saying that without really doing anything. Those factors plus becoming a new mom caring about how the community would affect my daughter and where I'm raising her, all sort of formed into this perfect storm of me being interested in politics and me wanting to do something. I wasn't confident enough in myself for like a state position so I decided to start with my community. You know, all politics start local. Leary: It wasn't a surprise to my family that I was going to run. I think they thought that I was already involved in so many other things that I wouldn't have time to do it. The other groups that I'm involved with have kind of been put on the back burner while I'm undertaking this. My daughter has been a great help. She's my proofreader and she has also been out now knocking on doors with me. So it's been a good experience for her as well. I'm hoping at some point she decides to run for office as well because I think she would be great. Parcher: That's fantastic. I know that for me telling my family that I was going to run more surprised them I think than in your situation. My daughter was four months old at the at the time that I decided to run. "One voice — one person — can have a big effect on society." Sam Parcher, candidate for Cameron Park Community Services District Board of Directors. I just came out and told my parents I said, “Hey, I think I'm going to run for CSD.” And they were like, “Well No. 1, why? But, No. 2, how?” Having a newborn, and I had just gone back to work at the time, I think they were more concerned with my getting burnt out. They also have been a huge support in helping to shift things around. I take the baby with me when I canvas. It's nice. We walk. She goes in her stroller and she just comes along with me, which is pretty fantastic. Leary: The campaign has its ups and downs. That's for sure. Working on the other campaigns is a lot easier than working on your own campaign and I'm my own campaign manager. I developed all of my materials for printing. I've set up my own website, set up my own Facebook page. I've learned a lot of technical skills that I didn't have before although I have been on Facebook for a while. Everything else was a little bit more challenging. I really enjoy canvassing. The best part is when you find someone home and they want to have a conversation. There's days when I feel really down, like, oh my gosh I wish this was over — when is it going to be Nov. 6? And then there's other days where I feel more energized. I think that's pretty common among most of the other candidates that I've talked to. One of the really important things to do is to continue to stay involved even if you don't win. That's clearly my goal if I don't win. I've had issues that have been brought to me during this whole process that I'm willing to continue to work on for the community. As a young person, I think it's really important to see — if you don't get elected — if you can get appointed to some other kind of board or commission or start a group in your area that involves more of the local people up there. The next time you run, which I'm thinking you should do, you will have more support, a broader base to work from. Parcher: That's a wonderful idea. Thank you for this conversation. There are days where it feels like it's too much and hearing and seeing you being living proof that you can do it all and you can evoke change while being a good mom and having time for your daughter, it means a lot to me. My advice to you is to keep going, keep making change. You seem to be so very involved in your community and it's very inspiring. The interview has been edited for clarity, style and length.